Here is a simple recipe that I shared recently on the webinar that I thought was worth posting here. It allows you to have the “Do not create a new opportunity upon conversion” checkbox that appears on the Lead Conversion screen to be checked by default when users click “Convert” on a Lead. Navigate to your setup -> “Develop” -> “Pages” and click to create a New Page. Copy and paste the code from below into the body, give it a name such as “convertWithNoOpp” or whatever you please. Save it. Then go to “Customize” -> “Leads” -> “Buttons and Links” and click “Override” next to the Convert button. 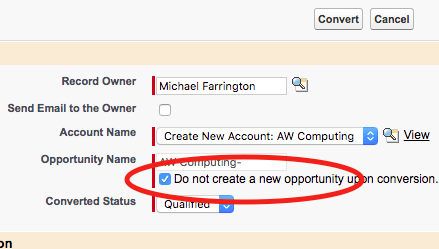 Select the “Visualforce Page” selection and from the dropdown find the Page you created. Save it… and you’re good to go!